Check out what Fright-Rags has for you on Valentine's Day. Pair your Valentine's Day dinner with some fava beans and a nice Chianti! Jonathan Demme's The Silence of the Lambs was released on February 14, 1991, and Fright-Rags continues the Valentine tradition with a new line of apparel from the Oscar-winning film that introduced Anthony Hopkins as Hannibal Lecter. The Silence of the Lambs collection includes four shirts, ranging from newly-commissioned artwork to production stills, including a glow-in-the-dark design. Put the lotion in the basket with a pair of crew socks and an enamel pin of the "death's-head" moth that has become synonymous with the film. Despite being portrayed by countless talented actors, no one embodies the character of Dracula more than Bela Lugosi. Fright-Rags has teamed with the Lugosi estate to release two shirts and a pair of socks featuring the classic horror icon in his signature Dracula costume. Later this month, Fright-Rags will expand its Goosebumps collection. The additions will include shirts for two of R.L. Stine’s bestselling Goosebumps books - Say Cheese and Die and One Day at Horrorland - along with a pair of socks featuring the Goosebumps logo. The Silence of the Lambs and Bela Lugosi collections are on sale now at Fright-Rags.com. 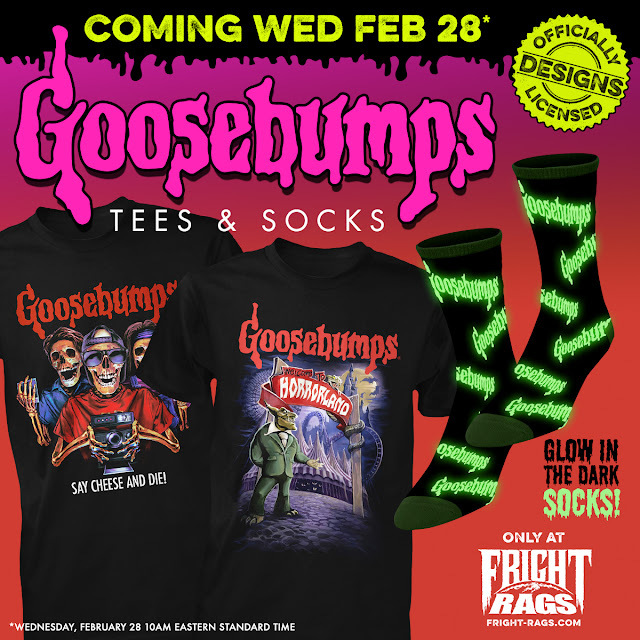 The Goosebumps collection will be released on February 28 at 10am EST. Fright-Rags is also re-printing several popular shirts on February 21, including designs from Halloween, The Thing, Dawn of the Dead, The Evil Dead, Creepshow, and more.